We’re now in the Denver area, staying at our favorite central stop, Cherry Creek State Park in Aurora. We’ll be here a few days catching up on work, visiting friends and Airstream Life contributors who live in the area, and taking care of a few minor maintenance items. I editorialized in the Fall 2009 Airstream Life about the budget cuts that are closing state parks and/or reducing services all over the country. More states are charging day use fees in their parks on top of the camping fees, and the fees are rising. We’ve been forced to buy annual passes in Wisconsin, Minnesota, and Colorado so far because the day use fees are more than the cost of the annual pass after just a few days. The windshield of the car is starting to get obscured by all the big stickers. In South Dakota we also paid $15 for a one-week pass because they don’t offer a single-day pass. Texas and California also have annual state park pass programs, Arizona is considering it, and I’m sure there are many other states as well. Wisconsin’s pass isn’t too expensive but Colorado’s is a monster at $63. Day use fees here at Cherry Creek are $8, so an eight-day stay justifies the pass. We won’t be here that long but we do plan to visit a few other Colorado state parks this month. All told, we’ve dropped about $120 in state park passes so far. I’ll have to add that expense into the budget for future trips, since user fees seem to be the trend these days. Have you considered adding a spec’s page to your blog? Specifically, what equipment are you using – camera, computers, upgrade specifics to the ‘stream such as solar panel sizes… I have been able to search both blogs and usually find references but it would be nice to have it on a single link. We did have something like that on the Tour of America blog, but it is now out of date. I’ll put the current specs and major equipment here so people can find it using the “search” box on this blog. 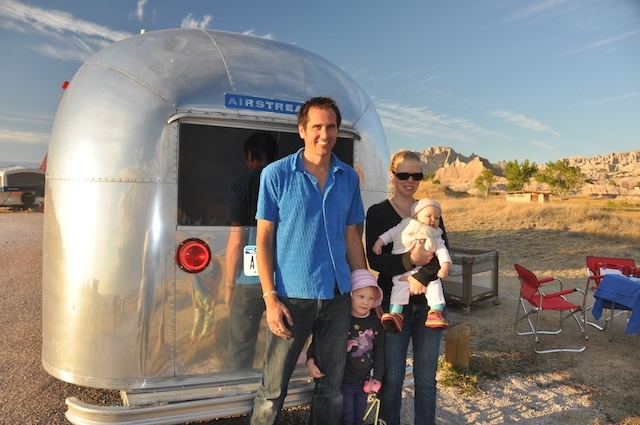 RV: 2005 Airstream Safari 30-ft “bunkhouse”. Empty weight 6400, GVWR 8400. Upgrades include: two 115 watt “Evergreen” solar panels, four Optima “blue top” AGM batteries, Tri-Metric 2020 battery monitor, Blue Sky Solar Boost 2000e MPPT solar controller, Kodiak disc brakes with Actibrake hydraulic brake actuator, 5000# axles, Dometic NDR1026 10-cu. ft. refrigerator, MaxxAir “Maxxfan” for ventilation, Northstar catalytic heater, Centramatic wheel balancers, stainless steel furnace & water heater covers from Roger Williams Airstream, many other minor modifications/upgrades. Tow vehicle: 2009 Mercedes GL320 Bluetec. V6 turbodiesel, 398 ft-lbs torque, 215 hp, 121″ wheelbase, with modified hitch receiver, otherwise stock. Typical fuel economy: 14 MPG towing, 25 MPG solo. Hitch: Hensley with straight receiver bar (slightly curved for better weight distribution), custom drilled hole for shorter overhang. I carry a set of spare parts for the Hensley including spare zerk (grease) fittings, and a grease gun. Computers: A 2009 MacBook Pro “unibody”, and a 2004 iBook G4. We also carry several backup hard drives, a battery-powered printer (HP OfficeJet H470), and a CanoScan LiDE60 flatbed scanner. Internet: Verizon USB card with Cradlepoint CTR500 cellular wifi router. I think that’s the majority of the stuff. Post a comment if you would like me to add more info here. This blog is meandering off its intended course as an occasional brain dump, and becoming a travelogue like the old Tour of America blog, but I suppose I’m OK with that if you are. And wow, what travels we have had in the past few days! We left off with you at Devils Tower National Monument in Wyoming. We caught the last two ranger programs of the season on chilly evenings and luckily also got some superb weather. On Sunday things turned chilly and gray, but not before I snapped the photo to the left in the early morning. Emma picked up her Junior Ranger badge and off we went. 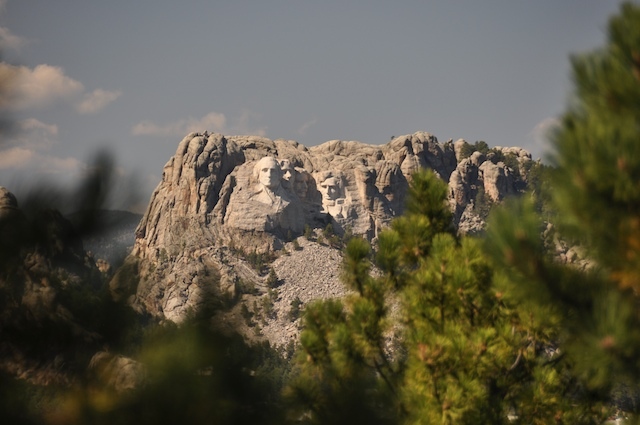 Our next stop was back over the line to South Dakota, and into the heart of the Black Hills. 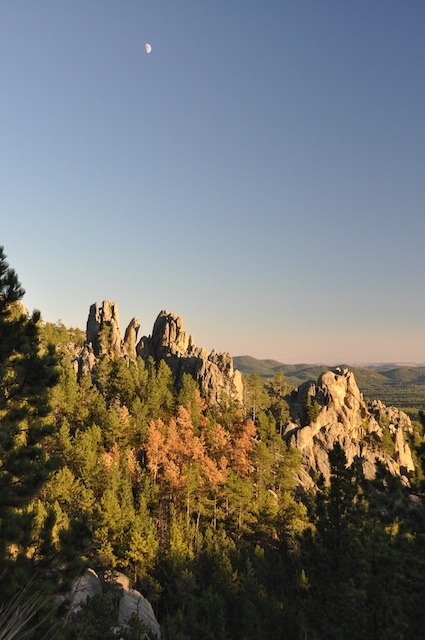 Custer State Park is the enormous centerpiece of the Black Hills, so large that it boasts hundreds of campsites, several lodges, lakes, several scenic highways, and even a playhouse. 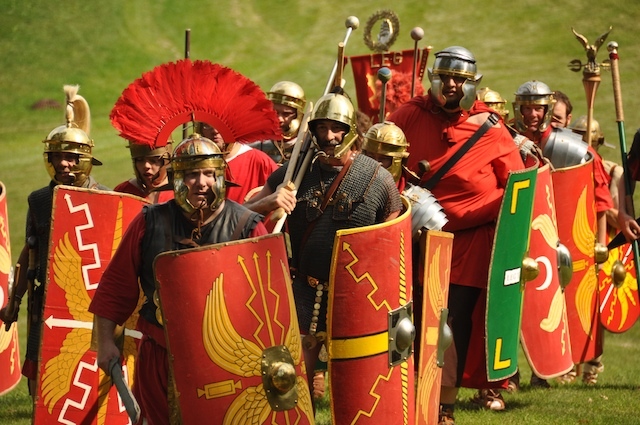 It is a truly remarkable place and well worth a visit despite moderately high camping fees. She was well enough by the time we reached Mt Rushmore to take a ranger-led hike and complete the Junior Ranger program, which meant she had achieved a personal best: two badges in a single day. And then we tested her resolve by taking Rt 87, the Needles Highway (view from the road pictured at left), back to the campground. This road is even crazier than Rt 16-A, with one tunnel only 8 feet 4 inches wide. Don’t take the trailer on this one! It’s a spectacular drive, especially at sunset, even if it does look like a pile of spaghetti on the GPS display. 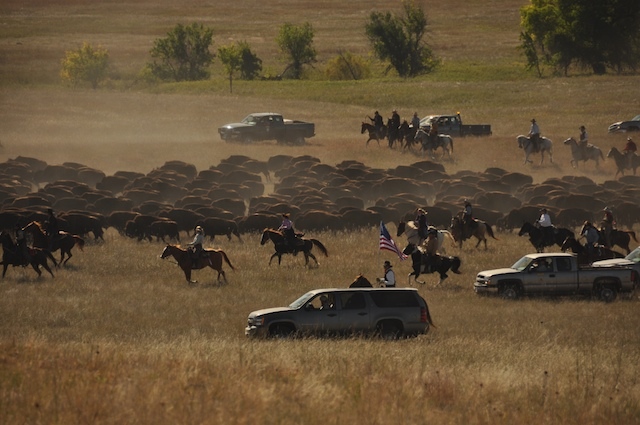 We were lucky enough to have arrived for the annual Buffalo Roundup in Custer State Park. This morning, along with thousands of other people, we arose early and drove across the park (35 minutes) to a viewing area. Once we arrived at 8:44 a.m., the road was closed and we waited in a grassy plain for about an hour. Eventually we spotted the buffalo coming over a hill, pushed by a team on horseback and four-wheel drive trucks. The rush of buffalo lasted for just a few minutes. Once they were corralled safely, the road was re-opened and we were allowed to leave. Later in the day a process of examining, vaccinating, and culling of the herd would begin, but we couldn’t stay for it. The peculiar thing about camping in Custer State Park is the dearth of dump stations. Apparently there’s only one in the whole huge park, and it can be a 20-30 minute drive from some campsites such as ours. Devils Tower also lacks a dump station, so it had been three nights in the trailer and we were beginning to wonder when we’d have a chance to deal with the necessities. Well, set such worries aside, because — look! There’s Jewel Cave National Monument right along the road west! Time was short but not so short that Emma couldn’t … well, you know … collect yet another Junior Ranger badge. Three in two days, another personal best. And then we stopped in the small town of Newcastle WY to pick up our mail at General Delivery. By this time it was past 2 p.m. and we had nearly full holding tanks, very little water, and 150 miles left to drive. We did it again: we packed too much into one day and now it was time to pay the price. There was one more stop after that, when we found a dump station at a I-25 rest area. It’s days like this that teamwork helps. With each new task (tire, milk, dump, water fill) everyone sprang into action and did what was needed. We got it all done somehow. Our last one was like a pitstop: dump tanks, fill fresh water, check lug nuts, grease the Hensley hitch, and we did it all in about 10 minutes including washing hands afterward. We may have to get team shirts someday. So we made it to Glendo State Park in eastern Wyoming as the sun was setting. That’s cutting it a little fine, but good enough. This park surrounds a man-made lake and features zillions of random unnumbered dirt sites all around the perimeter, much like its neighbor a little further south, Guernsey State Park. Camping-wise, it’s the wild west because the campgrounds are really just zigags of dirt trails running amongst the trees. Some sites can be identified by picnic tables and fire rings, and many others seem to be just spots battered out by the herd. Fortunately, there’s no competition for the sites. It’s late in the season, weekday, and the lake is mostly dry (whether by intentional action or drought, I don’t know). We will likely be completely alone with the wind tonight, and tomorrow we’ll be off early to get to our major stop, Denver. Next stop was for lunch and groceries in Spearfish SD, and because we didn’t rush it was about two hours later that we were finally back on I-90. By this point it was past five o’clock, and I realized we’d pushed our leisurely day a little too much. 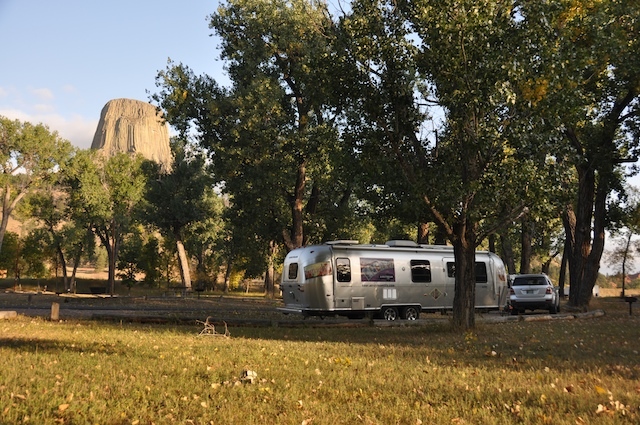 Our arrival at Devils Tower was projected as 6:45, just about sunset this time of year. Second, trying to get into a campground before dark encourages speeding, which is never a good idea with a big trailer behind you. This risk is complicated by the fact that a dusk the deer are out. We spotted many mule deer in the last 20 minutes of our tow, and had to slow down to about 20 MPH at one point to avoid a group that was crossing the road. Third, if something goes wrong, you’re solving the problem in the dark. I mean problems like a flat tire, a full campground, taking a wrong turn, or backing into a tricky campsite. And finally, it’s not fun to arrive at a campsite exhausted and grumpy after a long drive. Fortunately we arrived in a good mood. 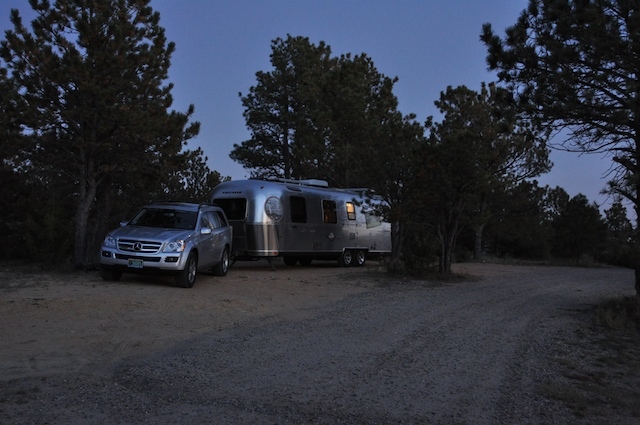 The drive across western South Dakota and into Wyoming was relaxing, with beautiful Black Hills scenery, late-afternoon sun lighting up the red outcrops, and the Airstream chasing us along the gently twisting roads. The campground here was unexpectedly nice, and we pulled in with 20 minutes to spare before the evening ranger talk in the amphitheater. It’s hard to believe this is the last weekend for ranger talks in this park. Conditions are just perfect: sunshine, cool nights, warm dry days. The old aspen trees that give the campground partial shade are just starting to turn yellow. The campground features big pull-through sites that are well-spaced in two loops, neatly kept and a bargain at $12 per night. We can see the Tower from our site, and even hike right from the campground up to the trails that circumscribe it. Best of all, it is peacefully quiet most of the time. We had budgeted two nights but I could easily be persuaded to spend three, even at the price of skipping Wind Cave on Monday. We are in “full boondock” mode, meaning that the refrigerator is running on propane rather than electricity, we get our heat from the catalytic heater rather than the inefficient and power-hungry furnace, the stove and oven take over jobs that would have been done by the microwave, and we rely on solar energy to replenish our batteries. We haven’t plugged into power since we left Mitchell SD on Wednesday morning, and may not see a power outlet for several more days. Power is no problem as long as the sun shines (and it looks likely to for a while), but we do need regular replenishment of liquified propane gas. In this mode of camping, propane becomes a mandatory supply like fresh water. Without propane we would lose our refrigeration, heat, hot water, and cooking capability all at once. I normally check the propane before each tow as a matter of routine, but this time of year I’ll check it daily because we can use up a tank (7 gallons) every week if the nights are freezing. Our first freezing night may be as soon as Sunday. We are at 4,400 feet, and from here on in we are going to be at higher altitudes until we get to southern Arizona. It’s hard to be bothered by freezing nights when the days are so spectacular. Fall in the west can be even better than summer. Scenic places are less crowded, daytimes are not scorching hot, summer thunderstorms are generally ending, and the hiking can be fantastic. I wish it could last longer. 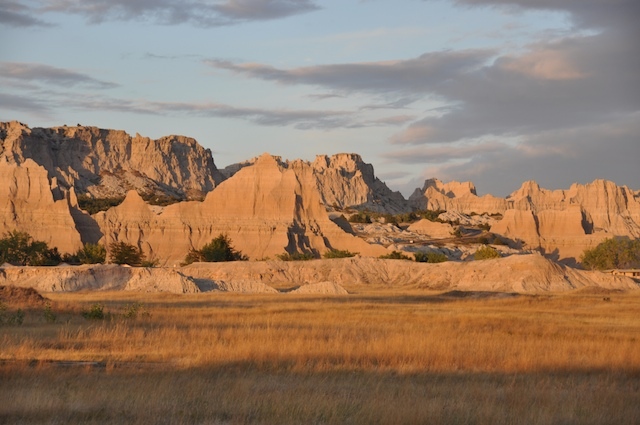 We were so inspired by Bert Gildart’s article in the latest Airstream Life (Fall 2009) that we decided on this trip we finally had to make a visit to Badlands National Park. That’s a big part of why we chose to go west across South Dakota rather than dipping south first. And it has been worth it. Every fall we come back west and the first taste of the west we usually get is when we drop in on a national park. It puts us right back into the western mood, and that gets me thinking of desert camping, rodeo events, prickly pear cactus, Rocky Mountains, and brilliant sunny days where you can see to the horizon. Badlands has had that effect. Suddenly we’re talking about extending the trip and not returning to Tucson until “later.” No decisions yet, but now that we’re out here in the crisp fall weather, it seems a shame to head back to home base already. In the Badlands campground we met up with a couple from the United Kingdom who just bought a 1966 Caravel at P&S Travel Trailer Service and are traveling for six months across the United States with it. Rather bravely, or insanely, depending on how you look at it, they are doing this with a three-year-old and a four-month old child. That’s a lot of people in a 17-foot vintage trailer with no gray tank, but they seem to be doing just fine and I applaud their effort. 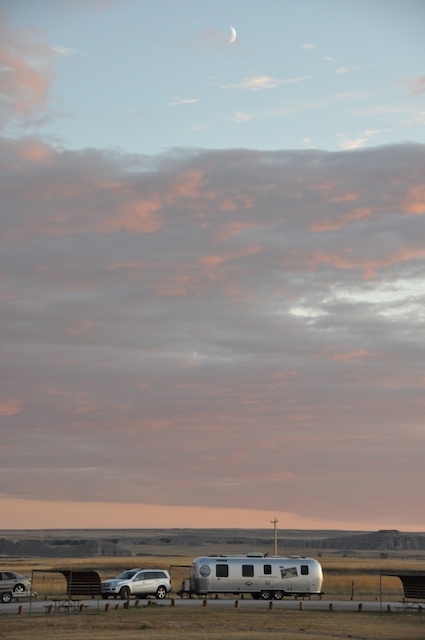 We joined them last night for some tea and then a look at the sunset over the Badlands, which is spectacular. 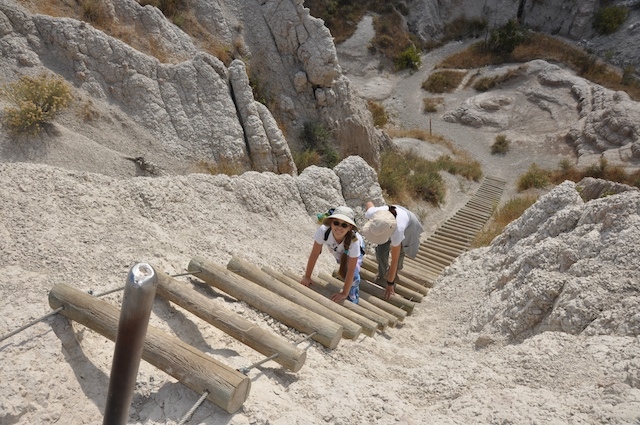 Badlands National Park is long and narrow, with only one paved road through the park and a handful of short trails. We were able to hike most of them in half a day, starting with an 8:30 a.m. ranger talk. Most are easy, with no major elevation changes. The only significant hazard is the unevenness of the terrain. Even the local prairie rattlesnake is very timid and nearly impossible to spot before it slithers away. Despite looking rather forbidding, the park is actually full of living creatures. Once upon a time there were grizzly bears here, but not any more. There remain: mule deer, bighorn sheep, prairie dogs, black-footed ferrets (nocturnal), ground squirrels, cliff swallows (and many other birds), lots of insects, and other things. It’s not desolate at all, although it lacks potable water for humans. The big story of this park is fossils — lots and lots of fossils, and more appearing with every heavy rain. 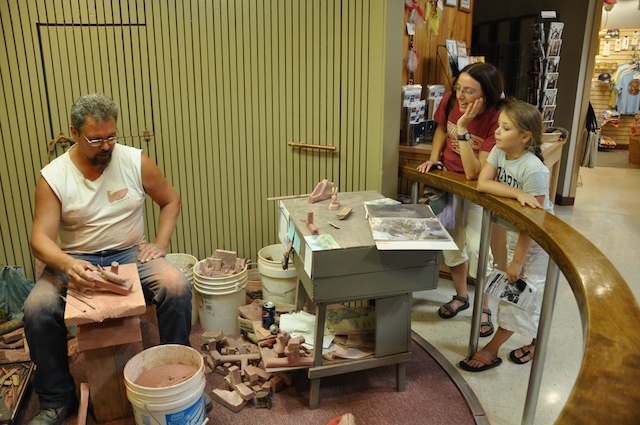 The Visitor Center has a great exhibit about the geological history of the park, and the rangers hold daily fossil talks. No dinosaurs, because this part of South Dakota was part of the ocean in the dinosaur era, but they did have one heck of a giant swimming thing that looks like a cross between a T-Rex and an alligator. The park is rapidly eroding (in geologic terms), and in about half a million years they say it will be gone. So plan your trip soon, and keep an eye out for bones of some giant titanothere sticking out of the clay. I recommend the hikes, if you want to get a good feel for the place. Stopping in Mitchell for two nights before coming here was definitely the right move. We waited out some truly lousy weather (50’s, rain, wind) in full-hookup comfort and got a bunch of work done, then arrived here just in time for spectacular fall weather. (We also got 14.0 MPG on the drive over, now that the horrible headwind is gone.) It is perfectly gorgeous now, and in a couple more days things will go downhill again, so the timing was perfect. 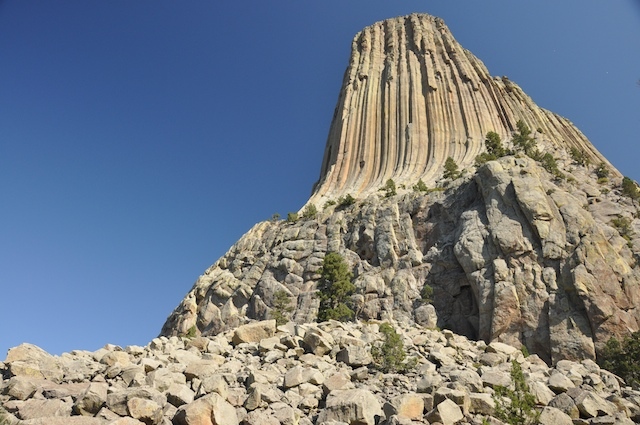 The only downside of this is that we can only give Badlands just two nights, which is really not enough time to see everything, because we want to get to Devil’s Tower for the weekend. 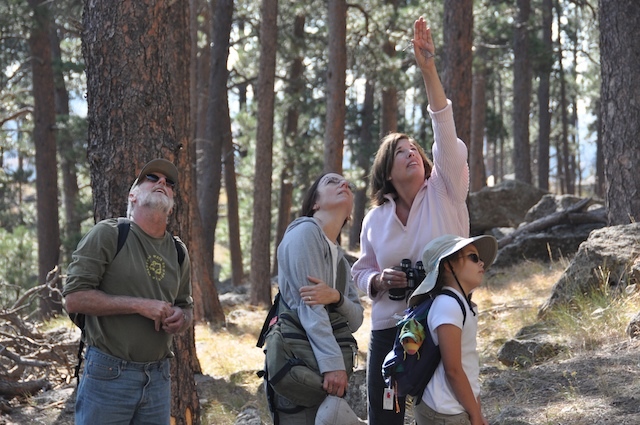 This is the end of the season in this area and that means ranger talks, guided tours, and evening campground amphitheater talks are becoming scarce. Those things add a lot of value to the park experience, so we’re going to try to take in as many as we can before it’s time to start migrating south. We also went back to a used bookstore in town where we’d bought a few books on Friday, and dropped off about a dozen books to free up some shelf space in the Airstream. That gave us $21.50 in trade credit, and so of course we picked up another eight or ten books. As I promised myself, we are done withe killer long drives, so on Sunday it was a relatively short 130 miles to Blue Mounds State Park in the southwest corner of Minnesota. Blue Mounds features a bison herd, which wasn’t in evidence when we visited, but our real destination was Pipestone National Monument about 20 miles north. Eleanor and I visited this park a couple of years ago without Emma and we wanted her to experience it — and of course do the Junior Ranger program, which she did. The campground at Blue Mounds is very nice, although I never did find out what the Blue Mounds were. For Sunday night entertainment we thought we’d visit the “historic downtown” of the nearby town of Luverne. Unfortunately it’s one of those rather dead downtowns that are found everywhere in the midwest, and on Sunday night they roll up the sidewalks early. Entertainment for the evening was limited to “burrito night” in the trailer and a Scooby Doo movie on DVD — and finding diesel fuel. When we switched to diesel power I knew that we’d face a greater challenge in finding fuel. That’s OK, because the extended range of the diesel more than makes up for the difference. 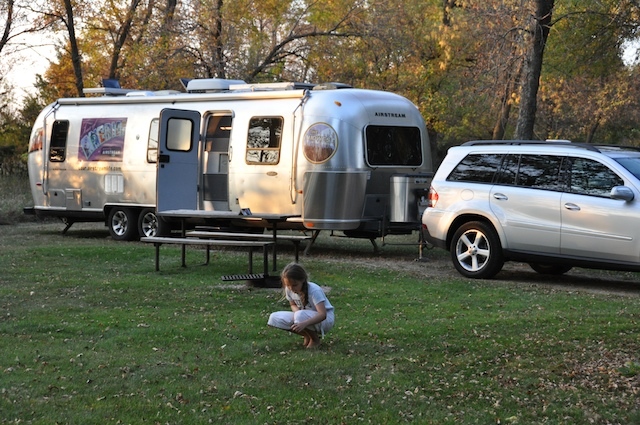 We can tow 380 miles, which is over 100 miles further than we could with the Armada. And not towing, our range is 600-650 miles! Using either fuel is not a problem as long as it is Ultra Low Sulphur Diesel (ULSD), and both were labeled as such. Across Canada and the US the conversion to ULSD is complete, so this is not a problem anymore, but last I heard there were still stations in Mexico delivering the older formulation of Low Sulphur Diesel (LSD). In Luverne we learned a new trick. The station had two diesel pumps, one dispensing “B5”, which is code for fuel that is 5% biodiesel, 95% dinosaur diesel. I was half-done filling with the B5 before I noticed the little sticker that identified my pump as the biodiesel pump (and 3 cents per gallon more expensive). Fortunately, Mercedes has rated the engine for B5 fuel. Still, I’m getting wary of diesel pumps. This morning we hitched up for another 100 mile drive, this time to Mitchell, South Dakota. There was some temptation to just plow through to Badlands National Park, which is our next major destination. But that would have been 340 miles of driving, through what turned out to be fairly poor weather. We were facing a stiff headwind on I-90, which reduced our towing fuel economy to the worst we’ve ever seen with the GL320: a lowly 11.5 MPG. At Mitchell we gave up and found a campground. Instead of battling the weather, we’re going to park ourselves here for a couple of nights and work instead. I’m finalizing articles for the Winter 2009 issue (due out in November), and Emma needs to get hustling on her fourth grade work. By getting our work done in a couple of intense days, we can all go to Badlands and drop off the grid for a couple of days with clear consciences. Mitchell is well known for two major attractions: The Corn Palace, and Cabela’s. We’ve actually spend a night at the Cabela’s in the past (it even has a dump station, which attracts RVs like flies), but never dropped in to find out what the heck a Corn Palace is. Turns out it is a sort of civic center/auditorium that is annually re-decorated with murals made of 13 colors of corn on the cob. It isn’t actually made of corn, which in this climate is definitely a good thing. A fire at the Palace would be an interesting thing. You bring the salt, I’ll bring the butter. The nearby downtown of Mitchell is suffering the fate of so many others, but it is still alive for the moment. It needs an injection of creativity and boldness if it is to survive. With the Corn Palace nearby, it at least has a chance. I see these places and I think of the differences between the ones that have deteriorated to nothing but trash and decaying buildings, and the ones that are still vibrant (like Burlington VT’s “Church Street Marketplace”), and I realize that often the key is somebody being entrepreneurial and aggressive. When the old formula doesn’t work anymore, it’s time to invent a new one. I hope somebody figures that out in Mitchell.